Expand your idea of yoga at Yasodhara Yoga Spokane. Discover your highest potential and inner Light at our beautiful studio set in the heart of the city. 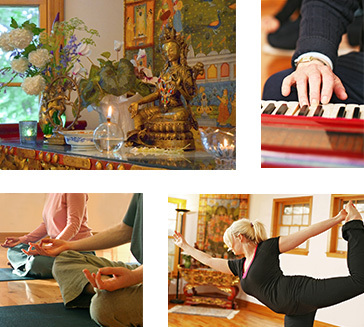 Established by Swami Radha in 1989, Yasodhara Yoga Spokane (formerly Radha Yoga Center) is a flourishing community with teachers trained at Yasodhara Ashram. We welcome people of all backgrounds and spiritual traditions to enjoy the benefits and inspiration of Yasodhara Yoga. Stretch body and mind, relax deeply, connect with your inner Light. Check out our classes and events calendar for our upcoming offerings. Session break: No classes April 29-May 4th. Next session: May 6th – June 29th. Our studio is in Spokane’s historic Browne’s Addition.